The Hilbert Museum of California Art at Chapman University is now presenting the Bay Area Scene Paintings exhibit. The exhibition depicts the diverse and beautiful cityscapes and landscapes of San Francisco and the surrounding Bay Area in more than 70 paintings by renowned California artists, including: Jade Fon Woo, Ralph Hulett, George Post, Jack Laycox, Sun Ying, Ken Potter, Lee Blair, Suong Yangchareon, and many others. An opening reception for this exhibition was held on Saturday, October 27 from 6pm to 8pm. On Saturday, January 19 at 4pm, Gordon T. McClelland delivered a PowerPoint presentation and talk on this exhibition. 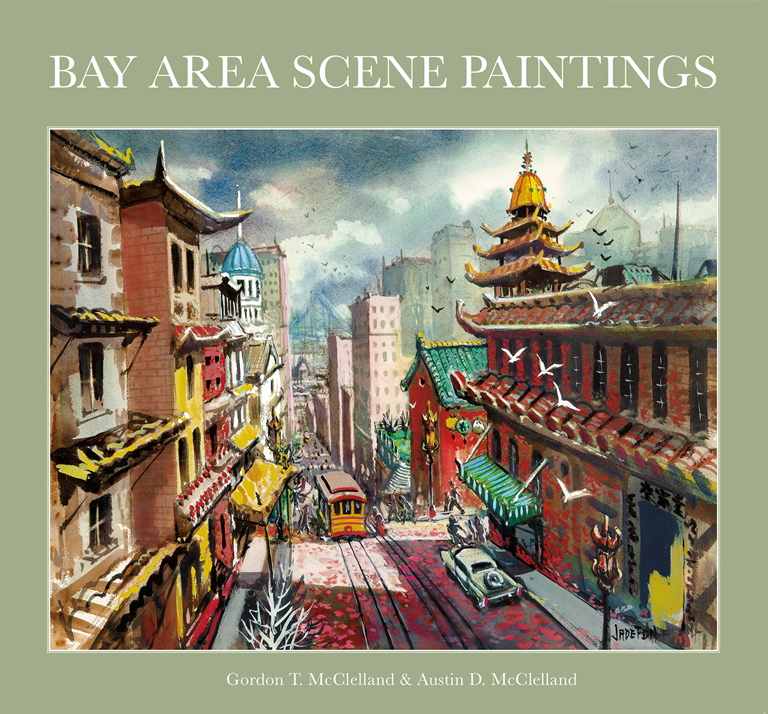 After his presentation, copies of the Bay Area Scene Paintings catalog were made available for purchase and signing by Gordon and Austin McClelland, co-authors and designers of the catalog. The publication includes full-color images and information about each painting in the exhibition. 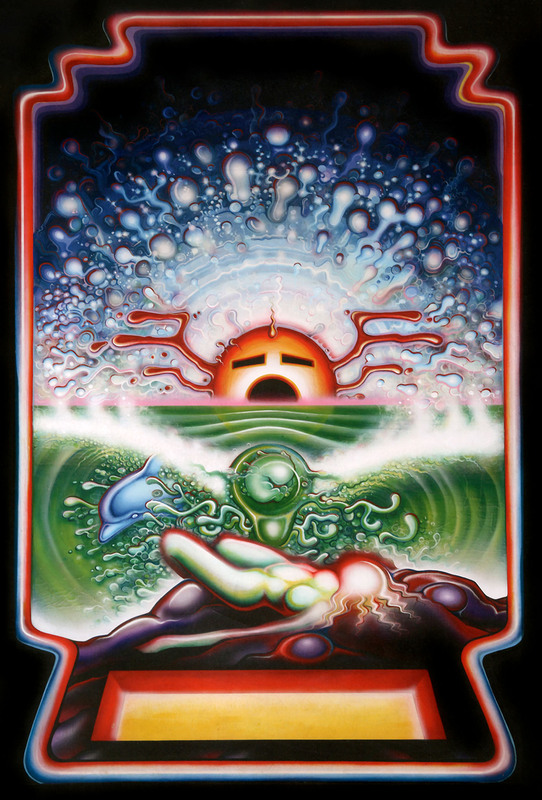 The Making Waves exhibition at The Hilbert Museum of California Art at Chapman University saluted two masterful artists: Rick Griffin and John Severson, who contributed much to the surfing culture in California and elsewhere. The exhibition included Griffin's influential painting "Pacific Vibrations" (pictured left), Severson's thrilling surf paintings, and a collection of surf ephemera, zines, and posters. 50/50: California Art in Transition, 1940 - 1970, curated by Glen Knowles, examined the period from World War II and the following three decades when new ideas of modernism came to California and influenced its artists and how art was taught in art schools. American Illustration: Children at Play launched at the Hilbert Museum's new American Illustration gallery, highlighted the works of accomplished artists who created illustrations for magazines, books, and other publications. This first exhibition featured works from the 1920s to 1950s by Joe DeMers, Stevan Dohanos, and Andrew Loomis, among others. The Magic of Disney Art, Featuring Pinocchio, in the Animation Art gallery, included four newly-acquired, original animation cels from the 1940 Disney classic film. Also on exhibit were animation art and concept art from Disney films Lady and the Tramp, and The Jungle Book. Well-known California artists who worked for Disney Studios, and were represented in the Hilbert Collection, include Eyvind Earle, Mary Blair, Phil Paradise, and Phil Dike. California Masters: Bradford J. Salamon featured works from the Hilbert Permanent Collection by the acclaimed Los Angeles artist. This exhibition included monumental "portraits" of vintage objects, food, and Star Wars' C-3PO. An opening reception for these exhibitions was held at the museum on Saturday, October 7 from 5 to 8:00 p.m.
On Saturday, January 20, 2018, Gordon gave a slideshow presentation of the exhibition at the museum from 2 to 3:00 p.m.
Click/tap here to go to the past events page.